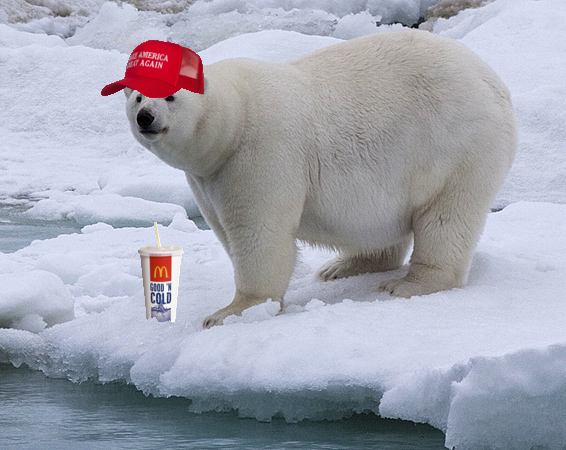 Jimbob Polar Bear says he’s got no complaints other than Muslims, immigration, and fake news. In response to National Geographic’s viral video of an emaciated polar bear dragging itself across Somerset Island – reportedly trying to reach Elon Musk to ask if there’s any way it could be moved to a planet without human beings – the GOP today released photos of a portly polar bear which they say shows that everything is just fine thank you very much. Saying this is an example of the EPA working proactively to make the Arctic a better place, Trump was quick to pounce on the photos as evidence that all is well in the far north. “Looky bear. Looky there. There’s a looky, looky bear,” the president said, in yet another statement that would be blamed on loose dentures but looked a great deal more like the final marbles dropping out of a cracked jar. Stepping in to take over, White House press secretary Sarah Sanders was her usual abrupt, if totally nonsensical, self.